The Hawk-headed Parrot (Deroptyus accipitrinus accipitrinus) - also known as the Red-fan Parrot or Guiana Hawk-headed Parrot -- is a South American parrot that is endemic to the Amazon Basin, specifically Brazil and Guiana. 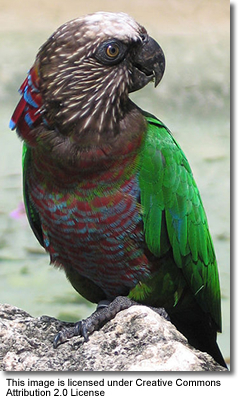 The Hawk-headed Parrot is known for its striking elongated neck feathers that can be raised to form an elaborate fan, thus greatly increasing the bird's apparent size. This parrot generally lives in forest areas, feeding in the canopy on fruits. The parrot is often seen swaying from side to side and emitting a whining sound. This is a threatened species due to the pet trade as well as habitat destruction from deforestation and conversion to pastureland. This South American parrot is known for its brilliantly colored plumage, and is named for the blue and red feathers around their head that are raised when they become excited or when it feels threatened. The most striking features are its flashy coloration and its ruff that -- when raised -- reminds us of an Indian headress or a lion's mane. Both the male and the female have a white fore crown and a brown throat with white streaks. The base of their neck is red edged with blue. The hawk-heads breast and belly are red and edged with electric blue. Their back, wings and tail are green. The underside of their tale is black. Some of the adults have a red spot under the base of their tail, and it is not related to gender. The juveniles have brown eyes and a lighter color beak. The adults have yellow eyes, a gray-black beak and gray legs. Sexing Both males and females look alike. DNA or surgical sexing is recommended. Noise Level: They can be loud with a raucous call that is similar to that of a seagull. 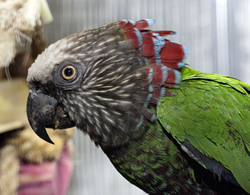 Housing: Minimum Cage Size: 24" x 24 " x 30" ... Bar Spacing: 3/4" to 1"
Personality: Handfed hawk-headed parrots are outgoing, playful, active, mischievous, excitable and occasionally high strung. They can be compared to the conure, which are similarly outgoing and playful, or to the amazon -- but less "bity" and temperamental. Hawk-headed parrots make excellent pets. Diet: Their natural diet consists of fruits, seeds, nuts, flowers,leaves and buds. Captive Hawk-heads require a diet rich in vitamin A. This special need can be met by feeding plenty of dark greens, such as collards and kale, as well as deep yellow to orange fruits and veggies including cantaloupe, peaches and sweet potatoes. They should receive a varied diet, including myriad veggies, legumes, fruits, greens, pasta and grains. Expensive birds, from $1,800 to $2,400. Females are rarer and usually cost more. They are not easy to breed and not too common in the United States. They are rarely found in a pet store. You would have to contact a breeder. The cost of a Hawk-Headed Parrot usually runs between $1,200 and $1,800. The accipitrinus sub-species are found along the Amazon basin north of the river and up into southern Venezuela.The fuscifrons subspecies are found south of the Amazon River going down into northern Brazil. Hawk-headed parrots mate for life. The male hawk-head cares for the female while she incubates the eggs. Cavity nesters The pair mate for life and nests in abandoned nest holes or in dead tree trunks and stumps. Chicks: The young start to fledge in the wild at approximately 10 weeks old. Handfed chicks wean at about 4 months. In captivity, chicks are customarily hand raised, because sometimes the male kills his mate and their offspring.